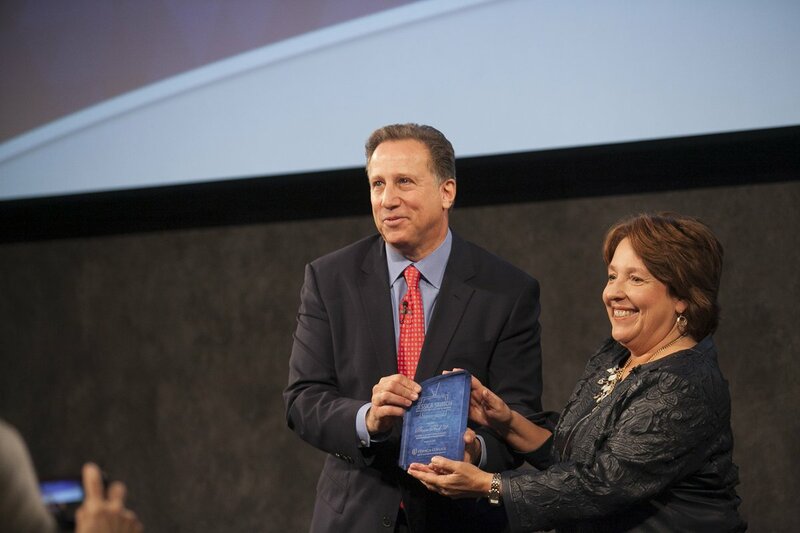 Bruce Beck ’78, the longtime anchor for NBC 4 New York, was presented with the Jessica Savitch Award of Distinction for Excellence in Journalism on March 10 at the Paley Center for Media in New York City in front of friends, family and dozens of Ithaca College students and alumni. The Savitch Award was established in honor of Ithaca College alumna and pioneering journalist Jessica Savitch ’68 to recognize journalists in their field as well as their ability to mentor the next generation of broadcasters. The veteran anchor said he was “thrilled and honored” to receive an award that bore Savitch’s name. He referred to his time at Ithaca College as four of the best years of his life, speaking fondly of the connections he made, as well as his 6:30 a.m. sports broadcasts. However, he spoke most earnestly of the phone calls he’d made of behalf of students trying to break into his profession. “I learned a long time ago, you can’t change the world, but you can impact lives,” he said. Beck, who called the event “a day for the ages,” also had a message for the Ithaca College student body. Many others who have worked with Beck also came to New York to honor him. Steve Mayer, ’84, chief content officer for the National Hockey League, recalled helping Beck when he was in high school, and attending Ithaca because Beck had done so. He also praised Beck’s passion for his profession. And Beck’s legacy is going to be felt for generations to come. NBC Sports’ Jimmy Roberts, whose son Jackson is a student in the Roy H. Park School of Communications, highlighted not only Beck’s professionalism, but his caring, supportive personality. Jessica Savitch graduated from Ithaca College in 1968 with a degree in television-radio and went on to a successful career in broadcast journalism, serving as a Washington correspondent for NBC News, anchoring the Saturday edition of “NBC Nightly News” and hosting the “Frontline” documentary series on PBS. After her untimely death in an automobile accident in 1983, the Jessica Savitch Communications Scholarship was established through gifts from her family, associates and friends to support Park School students who demonstrate excellence, achievement and promise in the field of broadcast journalism. The award was created to serve as a continuing recognition of Savitch’s pioneering spirit, professional dedication and overall influence on broadcast journalism. Past recipients of the Savitch Award include Barbara Walters, David Muir ’95 and Diane Sawyer.